[Guest post by Harshad Arole in Wai, India] Our destination – Wai, a small but historic town around 100km from Pune. 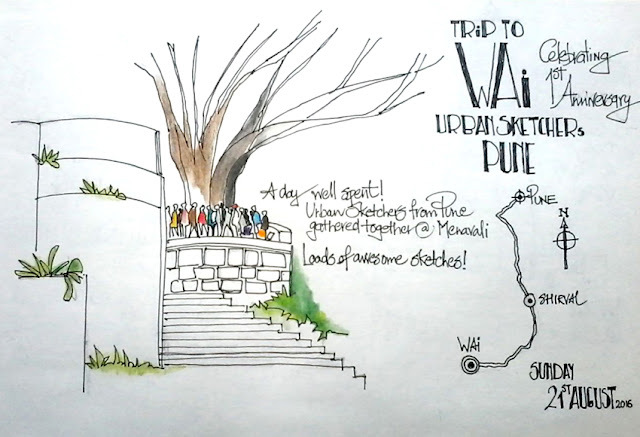 It is a year since the Urban Sketchers Pune chapter was formed and the group was on a sketching day trip to celebrate its first anniversary. Wai is dotted with numerous Hindu temples, traditional residences – called wadas – with their fantastic old architecture, and scenic riverfront vistas as the river Krishna weaves its way through. It was no doubt an overwhelming experience as everyone tried to capture the beauty as much as possible leaving us wanting for more. 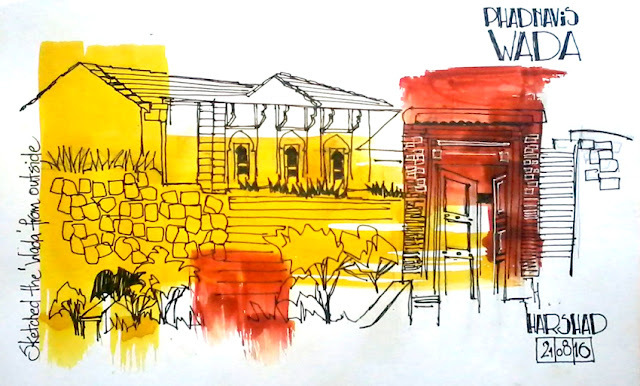 It was my first visit to this place as an urban sketcher and I present here some glimpses of the memories I could bring back with me. Holy places on riverbanks usually have steps called ghats leading down towards the river. 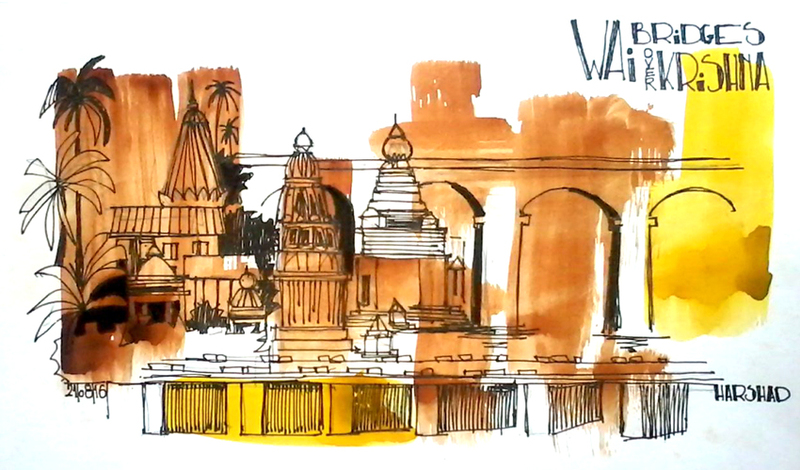 The ghats of Varanasi or Haridwar on the banks of river Ganga are well known. The main ghat of Wai's Dholya Ganapati Temple on the banks of river Krishna is a grand sight and I couldn't resist starting the day with a two-page panorama sketch. The ghats provide access to waters that are considered holy. This was asserted by the innumerable devotees taking a holy dip. The top image is another ghat, a bit away from the main one. I sketched this on paper on that I had previously painted patches of watercolour. I did a bundle of sketches on these papers through the day. 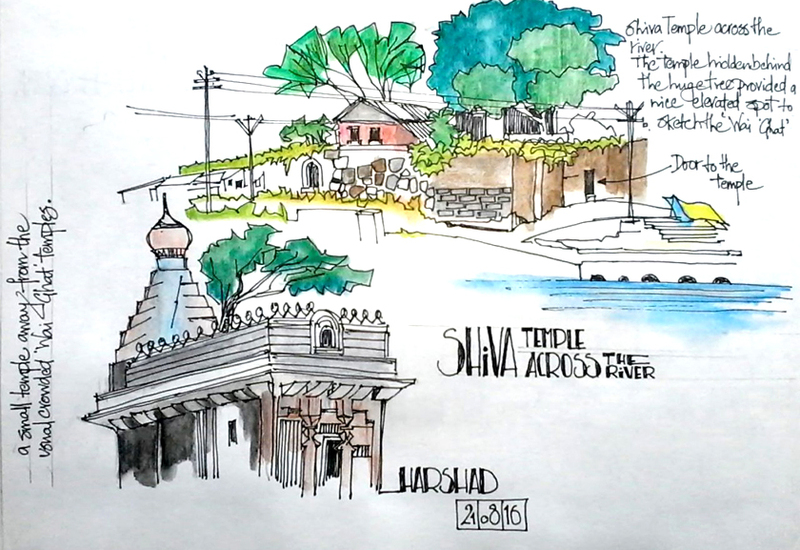 A bit away from the main ghat was a Shiva temple. 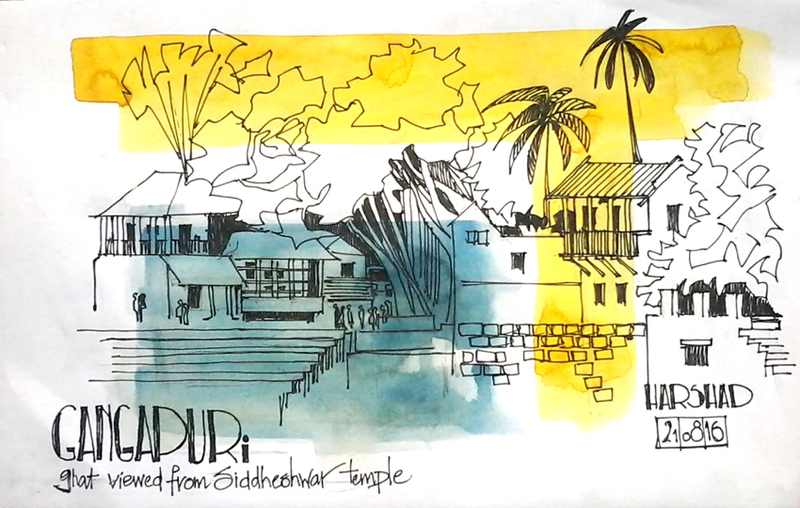 (Later one of the onlookers told me that its name was Siddheshwar Temple.) It was a secluded place from the hustle and bustle of the ghat across the river and provided a fantastic vantage point to observe the whole area. Every Shiva temple has at its entrance Nandi, the divine bull that was ridden by Shiva, the destroyer of the universe. The Nandi gazes into the temple at Shiva. 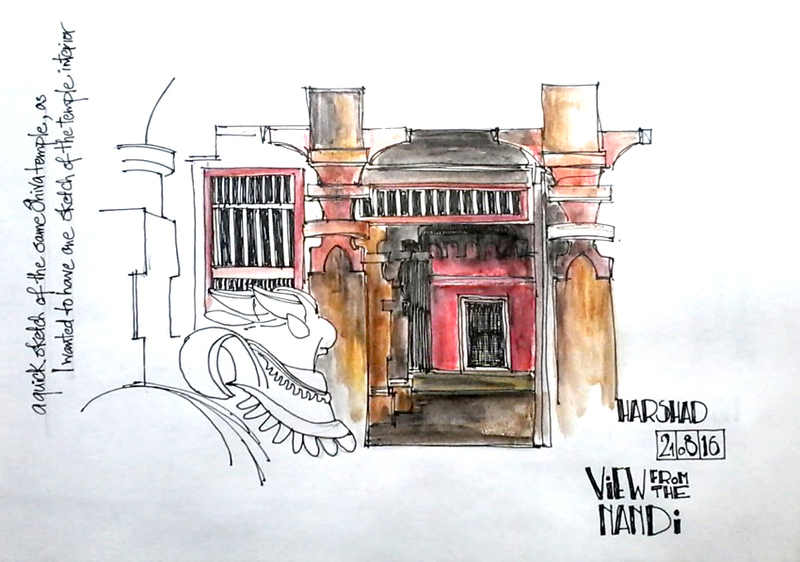 From where I was seated beside it, I could sketch the view of the dark interiors of the temple. 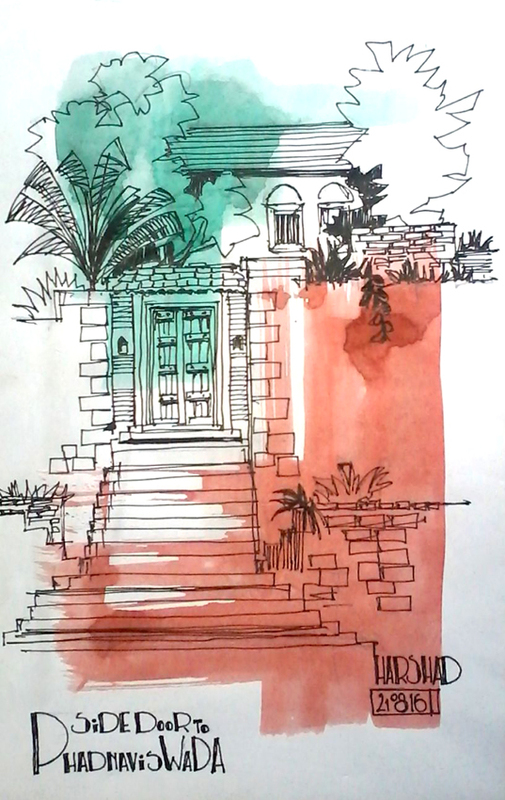 A wada is a traditional residence in Western India, similar to a mansion. I sketched the rear walls of a wada through which the temple peaks were seen. It seems these were the temples within private residences. This is a relatively modern bridge constructed over the river, at the foot of which I could see a cluster of five temples. From where I sat I counted 15-20 temples... a "Town of Temples" after all. This panorama sketch is of a serene and scenic ghat at Menavali, a place 3km away from Wai to which we proceeded in the afternoon. This ghat is an extension to the wada of Nana Phadnavis, an important minister in the Maratha Empire. The ghat and its beautiful surroundings have been home to numerous Bollywood and other movie shoots. 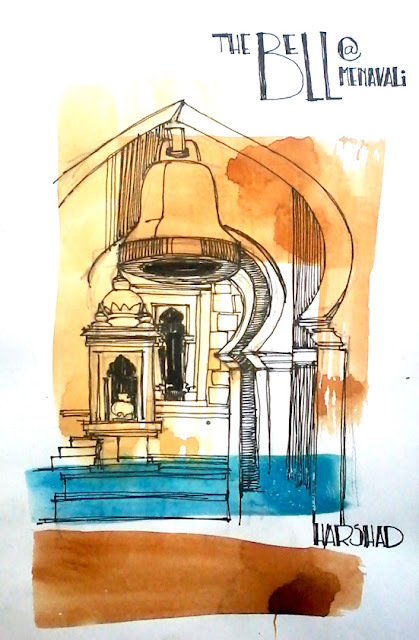 The Meneshwar temple at Menavali has a bell house where a 650kg bell (dating from 1707 AD) is installed. It is a war trophy captured by the Marathas from the Vasai Fort. Wadas on the banks of a river have a rear door that leads to the ghat to fetch and use the river water. The descendants of Nana Phadnavis still occupy a section in the old wada while the rest is in ruins. A portion of the wada is open for viewing the historical architecture and antiquities. 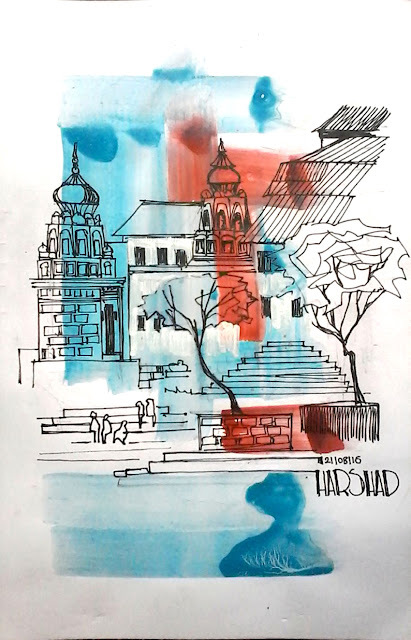 Harshad Arole is the founder of a PC/mobile game development studio based in Pune, India. He is a member of Urban Sketchers Pune. You can see more of Harshad’s sketches on his Facebook page.